On July 18, 2018, hundreds of people gathered on a Halifax jetty to say goodbye to 240 military personnel on board HMCS Ville de Quebec. Amidst thick fog and rain, families and friends waved goodbye to the Royal Canadian Navy frigate that was making history as it carried the new CH-148 Cyclone maritime helicopter on its first operational deployment. The ship was setting course for Operation Reassurance, where it joined Standing NATO Maritime Group Two (SNMG2) in the Mediterranean Sea. During the six-month deployment, Ville de Quebec (VDQ) and its Cyclone conducted surface patrols and subsurface surveillance while participating in training exercises to ensure combat readiness. The helicopter-callsign “Avalanche”-flew more than 500 hours and 170 missions while at sea with VDQ. By all accounts, its first operational deployment was a resounding success. Maj Erik Weigelin commanded the ship’s helicopter air detachment (HELAIRDET), which included 21 members of the Royal Canadian Air Force (RCAF)-eight aircrew, one mission support member, and 12 technicians from the aviation systems, avionics systems, aircraft structures, and air weapons trades. All were members of 423 Maritime Helicopter (MH) Squadron at 12 Wing Shearwater, N.S. “This first operational deployment of the Cyclone has been a great experience for the members of the HELAIRDET and myself, as we have all been involved in the Cyclone project for many years,” said Weigelin following the mission’s conclusion on Jan. 21, 2019. While aboard the ship, the HELAIRDET marked several impressive firsts, including carrying out the first-ever 400-hour Cyclone inspection. In October, the detachment honed its interoperability with Allies while participating in Exercise Trident Juncture, which allowed it to work and train with naval ships, submarines, helicopters, and fixed-wing aircraft from Canada, Norway, Spain, Japan, the United States, and the Netherlands. At the beginning of 2018, 12 Wing commander Col Sid Connor told Skies that the Wing was focused on wrapping up the new helicopter’s operational testing while transitioning aircrew and maintainers from their previous roles with the Cyclone’s predecessor, the CH-124 Sea King. Their goal was simple: to be mission ready. 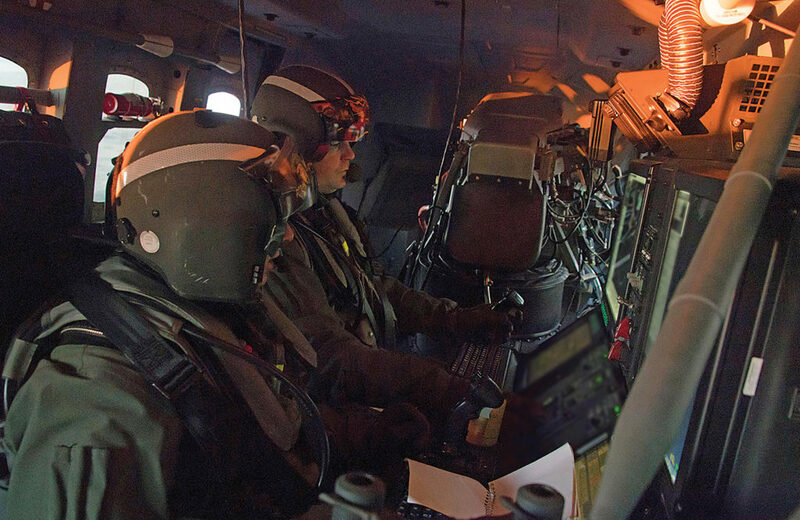 Last June, the new helicopter achieved initial operational capability (IOC), a milestone that paved the way for its first deployment on VDQ in July. 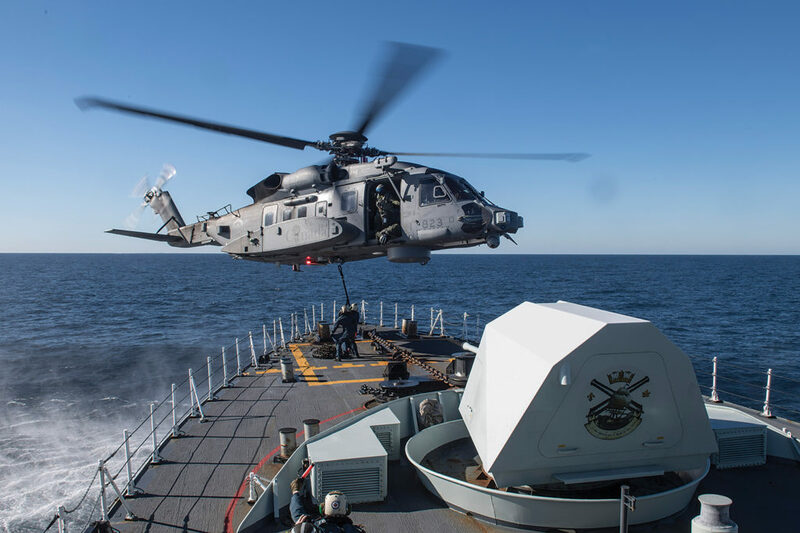 And while Canada’s entire fleet of Cyclones flew about 1,200 hours in fiscal year 2017 (April 2017 to March 2018), those numbers increased by two-and-a-half times to 3,000 hours for fiscal year 2018, which concluded on March 31. At the time of writing in late March 2019, there were two HELAIRDETS on deployment, and Connor said that is the operational tempo the Wing expects to see over the next few years. Once the Cyclone program is granted full operational capability (FOC)-targeted for late 2022-it is expecting to have 11 operationally-ready detachments. This includes six at 423 MH Squadron in Shearwater and five more at 443 MH Squadron in Patricia Bay, B.C. 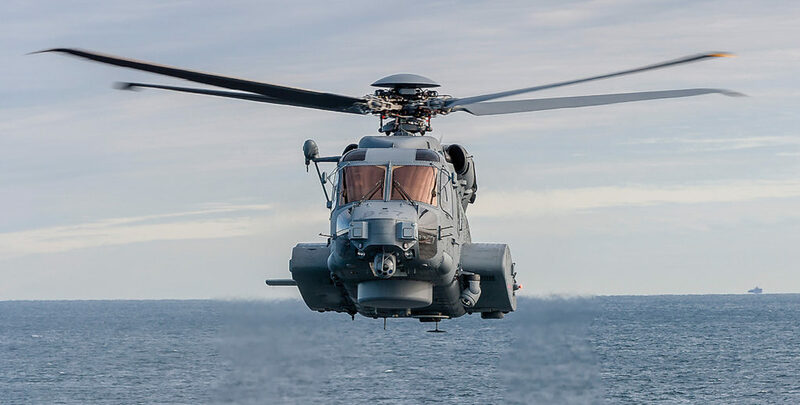 The West Coast squadron received its first Cyclone in August 2018 and flew it alongside the CH-124 Sea King last fall. On Dec. 17, 2018, Canada’s last four Sea Kings flew over Victoria to mark the type’s final in-service flight. Today, there are three Block 2 Cyclones allocated to 443 MH Squadron. At the time of writing, one was deployed on HMCS Regina while the other two were being used for training. In order to reach full operational capability, Connor explained that both mechanical and human components will need to be ready. On the mechanical side, that means taking delivery of all 28 CH-148 Cyclones ordered by Canada, with all of them in the final Block 2.1 configuration. Currently, 17 aircraft have been received so far. Thirteen of those are at the Wing, with four back at Sikorsky for upgrades. The helicopters on operational deployment are in the Block 2 configuration, while 406 Maritime Operational Training Squadron at 12 Wing is using older Block 1 models for instructional purposes. To reach FOC, 12 Wing’s people must also be ready. A Cyclone crew includes two pilots, one tactical operator (TACCO) and one sensor operator (SENSO). Aircrew conversion training began at the 12 Wing “schoolhouse” in September 2017 and has continued to ramp up. Pilot conversion training takes about five months, while TACCO and SENSO courses are around six months long. “We’re making good progress on training. We have aircrew courses graduating through this month and when they’re done, we’ll have 44 pilots trained on the Cyclone,” said Connor in March. He added that 19 TACCOs and 18 SENSOs have also been trained. On the maintenance side, 375 technicians have finished their basic servicing course for Cyclone towing, refuelling, marshalling, and starts/shutdowns. In addition, 167 aviation systems (AVN), 112 avionics systems (AVS), 24 aircraft structure (ACS) and 16 air weapons systems (AWS) technicians have been certified. “What that means numbers-wise is that we are about 50 per cent there for aircrews and about 70 per cent there for technicians,” explained Connor. 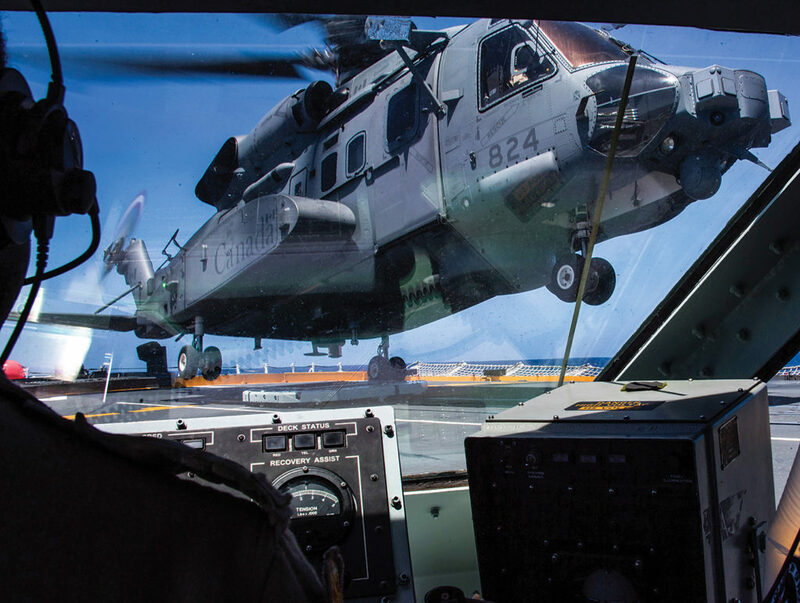 Over the five-and-a-half decades that Canada flew the Sea King, countless lessons were learned. In fact, you could comfortably say that 12 Wing was an authority on the venerable maritime helicopter. And if they didn’t have the solution to a given situation, it was a sure bet that someone in the global community of Sea King operators would. It’s a different story with the Cyclone. 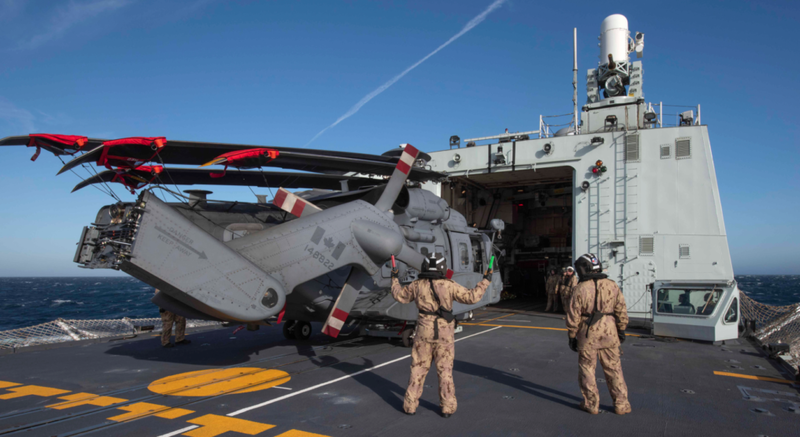 As the type’s first operator, Canada is blazing a new trail in maritime helicopter operations. Yet as much as it is learning the ways of the Cyclone, 12 Wing is at the same time the world expert on the platform. Many of those lessons come from deployments, and the Wing commander said those are transmitted in “real time” back to Shearwater. He cited that first 400-hour inspection at sea as being of particular value to 12 Air Maintenance Squadron back in Shearwater. Aircrews also encountered “other entities” while on deployment, and were able to use their communication and sensor equipment to track them. Feedback was transmitted to the schoolhouse so training could be modified accordingly. 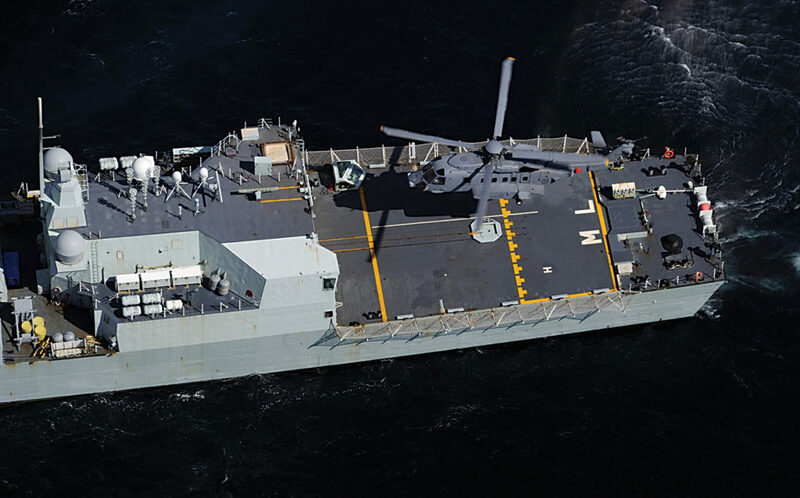 Further lessons will no doubt be learned from a Feb. 18 incident where a Cyclone helicopter deployed with HMCS Regina experienced what the Air Force called a “hard landing” on the deck of naval replenishment unit (NRU) Asterix. No personnel were seriously injured in the incident, which took place west of Kauai, Hawaii. Connor said the incident happened while Asterix-a new vessel-was in the midst of ship-helicopter operational limitations (SHOL) testing to qualify its deck to accept helicopters. On the day of the occurrence, tests were being done in an expanded wind and ship motion envelope. Connor said those included Sea State 3 conditions with waves up to 1.25 metres high and winds of about 20 knots or 40 kilometres per hour. The pilot flying the Cyclone at the time of the incident was a former Sea King and AETE pilot who was current on the CH-148 and had flown much of the ET&E for its development. While an investigation is ongoing, he added that the incident was not caused by an issue that would affect the entire fleet. 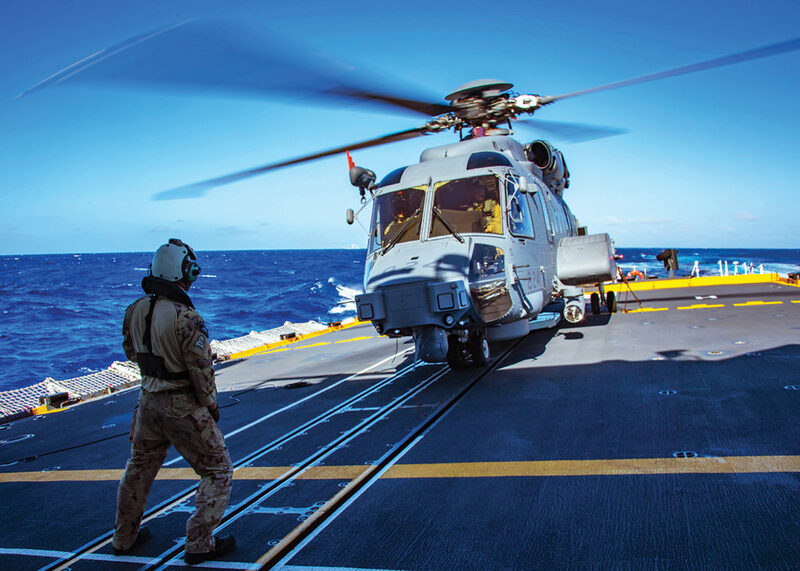 The helicopter was repaired on board the Asterix while it was docked in Guam, and it is now back at sea. The Cyclone operates with a fly-by-wire system that replaces traditional mechanical flight controls found on older helicopters such as the Sea King. 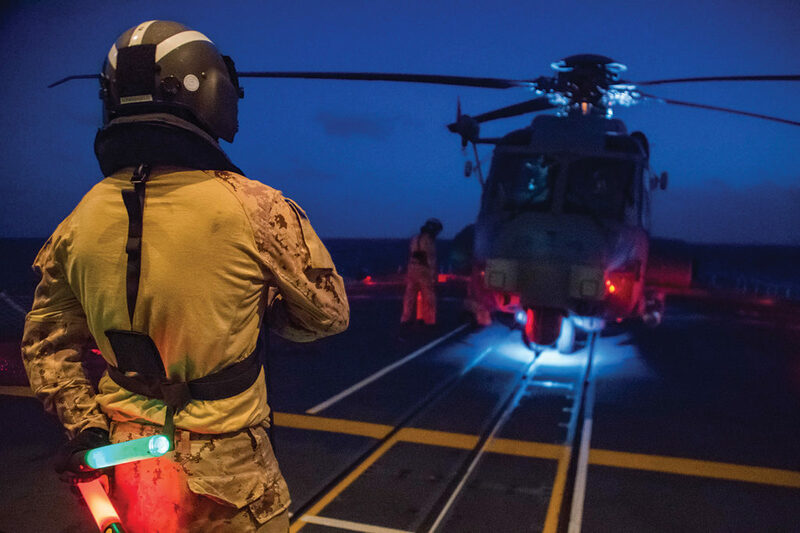 Along with operational lessons, the RCAF must also learn how to manage the vast amounts of data produced by its new maritime helicopter. The Cyclone flies further and faster than the Sea King so it covers more area, effectively expanding the eyes and ears of the ship. Its modern electro-optical/infrared (EO/IR) system, along with sonar, sonobuoy processing and imaging radar, generates a plethora of valuable operational data that 12 Wing is learning how to mine. While data is downloaded from the aircraft and used to inform the maintenance computer system, there is also mission-related information being generated from the various onboard sensors. Connor added that the Cyclone’s operational data is also used to inform the crews of other RCAF platforms. 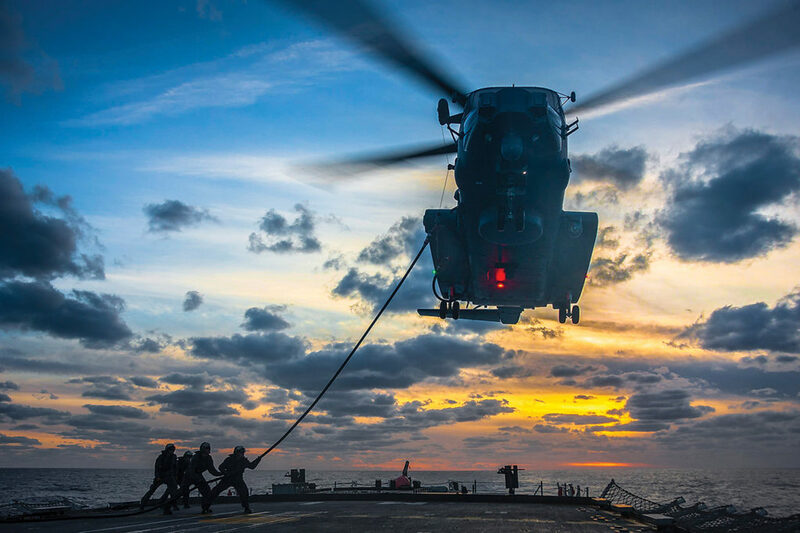 While current Cyclone HELAIRDETs are concentrating on traditional roles such as anti-submarine warfare and search and rescue when required, Connor said he fully expects crews to be asked to do more in the future because of the helicopter’s extensive range of capabilities. As it works to reach FOC with the Cyclone, 12 Wing will need every one of its experienced personnel. Luckily-unlike other Air Force squadrons-very few pilots and maintainers are being lured away by civilian jobs. In fact, Connor said the Wing has lower attrition rates than in the past, something he attributes to the excitement of working on the cutting-edge Cyclone. Looking ahead, Connor said 12 Wing will continue to prioritize training. As he looks back on the recent experience gathered from the Cyclone’s first operational deployments, Connor said the progress over the past year has been amazing. There’s no doubt Connor is proud of the hard work that’s been done at 12 Wing, and he’s always happy to discuss the new maritime helicopter.